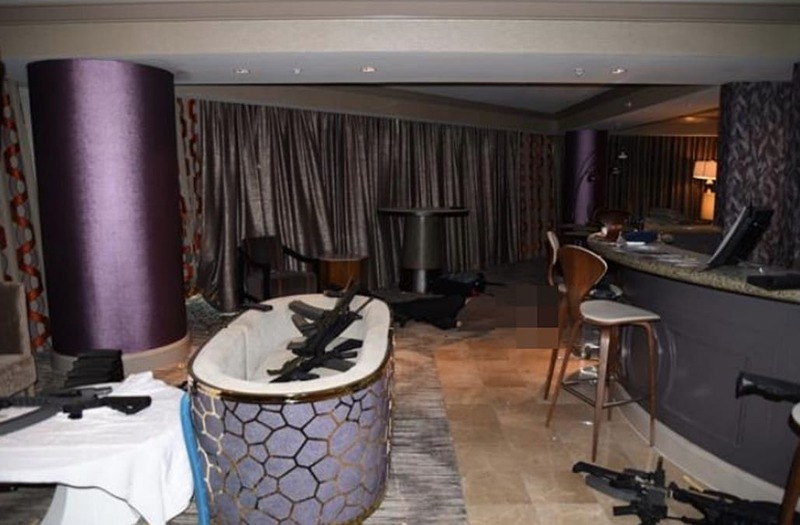 The Las Vegas Police Department released graphic new photos that provide a chilling look inside Stephen Paddock's 32nd-floor Mandalay Bay Hotel room, from which he committed the worst mass shooting in modern U.S. history. The images depict Paddock's dead body surrounded by an arsenal of weapons, which he used to rain bullets down on the Route 91 Harvest Country Music Festival on October 1, killing 58 concertgoers and injuring hundreds more. The crime scene photos also show the cameras Paddock hid outside of his room to keep an eye out for hotel staff and policemen, including one inside of a food cart and one mounted on his door's peephole. After the deadly attack, Paddock took his own life by shooting himself in the mouth, according to officials.